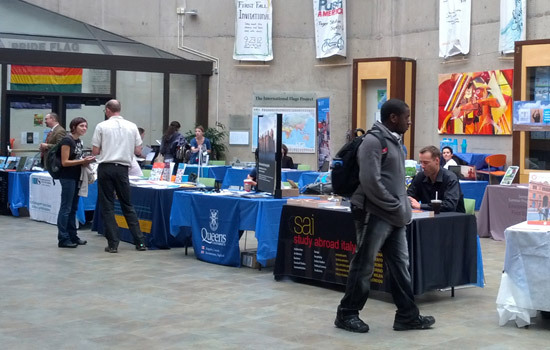 Representatives from many of RIT’s affiliate programs were on-hand at the Study Abroad Fair in the Student Alumni Union. Hundreds of students attended this year’s Study Abroad Fair on Tuesday in the lobby of the Student Alumni Union, conducted by the RIT Study Abroad & Fellowships Office. Students had a chance to meet and speak with representatives from the various study abroad programs as well as staff from RIT. Representatives set up tables with an abundance of informative materials, including pamphlets and checklists. Students had the opportunity to speak with representatives from programs such as Danish Institute for Study Abroad, Queen’s University at Kingston and Council on International Educational Exchange, among many others. RIT’s three international campuses in Croatia, Dubai and Kosovo were also represented at the fair. While the programs that are offered vary extensively, representatives agreed that studying abroad affords students a new world-view and a diverse set of experiences. Three types of programs are offered by RIT: global campus programs, faculty-led programs and affiliate programs. Last year, 311 students studied abroad, an increase over the previous year of 275. The Study Abroad & Fellowships staff is available to assist any students interested in studying in another country. Information sessions are available from 11 a.m. to 5 p.m. today, Sept. 19, in the Study Abroad & Fellowships office, located in Global Village building 400, room 2070. For more information, go to www.rit.edu/academicaffairs/studyabroad.